Earlier, Angular.js won much popularity between 2013 and 2015, and later React.js earned better popularity than angular.js. But, Vue.js doesn’t have that popular yet but slowly increasing. Since, both the equal and react has tremendous tools and web components to design and develop a customized web page, the developers can go with either of the frameworks. In contrast to their level of expertise and familiarity and demand of the client, they can proceed. If a client has got any reference from his known circle, the developer has to incorporate what the client desire only. Therefore, this point is crucial at the time of choosing a framework. Apparently, the demand for react.js has been going up and going down a little bit for angular.js. 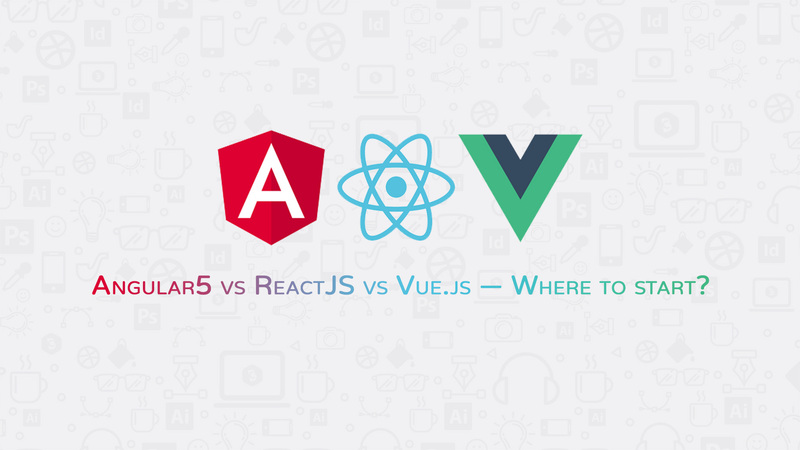 Vue.js is growing as well for its specific convenient structure but, less than the main frameworks. It comes with new features and functions like improved RXJS, quicker compilation (approx 2 seconds), and new Http Client. The two-way data binding system enables tremendous support for the app which reduced risks of possible errors. MVVM stands for Model View View Model. It also enables developers to work independently on the same application part through the same set of data. Its complete documentation system allows receiving all required information for the individual developer without taking assistance from his/her senior team members. However, this needs more time for learning. Some complex syntax comes from the first version of Angular. However, Angular.js 5 incorporates TypeScript 2.4 for easier learning. It may create migration issues at the time of transferring from old to new version. The developers find it easier to learn and implementation React.js because of its simplicity regarding syntax. The developers just have to apply their HTML coding skills and that’s it. Similarly, the developers don’t have to learn TypeScript likewise Angular. On the whole, the web application will have the top level of flexibility and great responsiveness. VDOM refers to Virtual Document Object Model that enables arranging documents in XHTML, HTML, or XML formats into a tree model. The web browsers can access elements easily at the time of parsing different components of the web app. Most of the developers work on React 15 version with SVG attribute and lighter DOM, etc. Recently in May-2018, Facebook has released React 16.4 version with many excellent features. By combining with ES6/7, React.js can work with the maximum load in a smooth procedure. It has downward data binding system which means the child table data cannot affect parent data anymore. React.js doesn’t keep the place for the appropriate documentation which may cause trouble to the team of developers. It also provides few options to choose by developers. It takes much time to become expert over React.js regarding integration of user interface with MVC framework. Similarly, it Empowers HTML block, detailed documentation facility for developers, adaptability, large scaling, tiny size and weight around20 KN. Some companies that use Vue.js: Alibaba, Xiaomi, Adobe, WizzAir, Grammarly, EuroNews, Gitlab and Behance, Laracasts, Codeship, and Reuters. It has several drawbacks like lack of crucial resources for complex web pages, the risk of flexibility and fixed Chinese background, Still, it needs to be modified. In conclusion, the developers now must come to deciding stage according to their experience. They don’t have to face any more confusion which framework needs to be taken in to process. Please feel free to add the comments if any query.